It’s hard to sit back and watch your child “figure things out.” With art as with life, those moments between struggle and success seem painfully long. But many of the greatest artists created their signature works in that span of time. That gap is called craft - and in the fast-paced world kids live in we’ve forgotten that honing a craft takes time. Be patience and supportive. Wrong Way: What is it? Right Way: Tell me more about your artwork. Yep, it’s just that easy. Consider framing your child’s art – but not everything. Have your child pick one or two pieces of work she deems most proud of. Buy frames you can change out easily so artwork can rotate like a gallery. 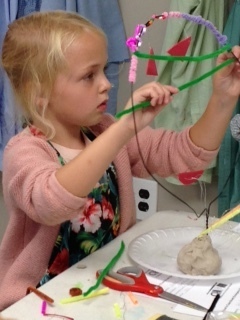 The “pick two” allows your child to recognize what she feels is her strongest work, as she begins to realize not all work is frame-worthy, but rather part of learning a craft. You’re setting them up for success with a foundation of reality. One of the hardest transitions for a young artist is to jump from what he knows he draws well to exploring (and often first failing at) drawing something out of his comfort zone. Artists - even the youngest of us, grow when we learn. So how do you get your child to step away from cartoons (temporarily) and take on still life or landscape? I find truth helps. Acknowledging in a conservation that this change might be scary. Don’t put down the drawing your child currently succeeds with. Try and blend the two. Lastly, reassure your child that he will always be able to freely draw, but knowing the techniques and principles behind all drawing will make him an all-around better artist. Nature frightens some people - but for artists it’s full of inspiration. Encourage your child to get outside. Which means - yep, turn off the screens and lead by example – do it together. Explore textures, shapes, and colors in nature. Truly pay attention. All principles in art come from nature- form, value, scale, texture, etc. Observing the world together shows support and gives your child information and a foundation to draw from. If I had a dollar for every parent who told me they aren’t creative, I’d be sipping margaritas on the porch of my Hawaiian beach bungalow - joyfully retired. Children learn from watching us, so be good to yourself, too. "I stink at painting," or, "I'm not artistic," or, “I can’t write,” shows that you don’t value trying to learn. Hold the negativity. Step into your child’s world in order to better understand it.